We know different sources of lateral loads are applied in deep foundation and we consider deep foundation is capable of taking these loads. In this regard some tests should be conducted along with axial load testing. When owner side think lateral testing is essential, this testing will be conducted before axial load testing and should comply with ASTM D3966. ASTM D3966-“Standaard test methods for deep foundation under lateral loads”-this testing method in field provides us most acceptable relationship between lateral load to which deep foundation subjected and lateral movement as a result of such loading. This test results also provide information that can be used to determined lateral resistance distribution along pile shaft and also long-term behavior of load-deflection.With this test results foundation engineer can determine ultimate capacity of pile under lateral load and deflection under service load after using proper factor of safety of pile/pile group. Soil-pile interaction properties can be determined using appropriate instrumentation; like co-efficient of subgrade reaction in horizontal direction which helps designer to calculate lateral deflecting resulting from bending stress over entire length of pile. Sometimes piles are installed in inclined direction; if foundation engineer considers testing pile for lateral loading in inclined pile is impractical, lateral load test results for a neighbor vertical pile can be used to interpret lateral capacity of inclined pile. 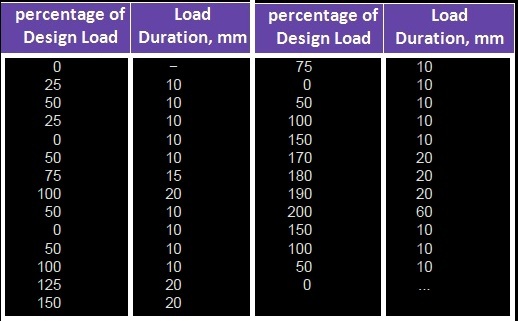 If considered feasible, keeping loading within safe structural load on pile/piles or pile cap, maximum load should be applied to reach failure load, which help engineer to determine ultimate capacity under lateral load of pile. With failure load, foundation designer may improve efficiency of foundation applying less factor of safety which will reduce pile quantity/size and length too. • Observation of various instrumentations. Any space in upper annulus of test pile or piles should be backfilled with suitable materials like sand and identical method and materials of backfilling should be applied for all other production piles. 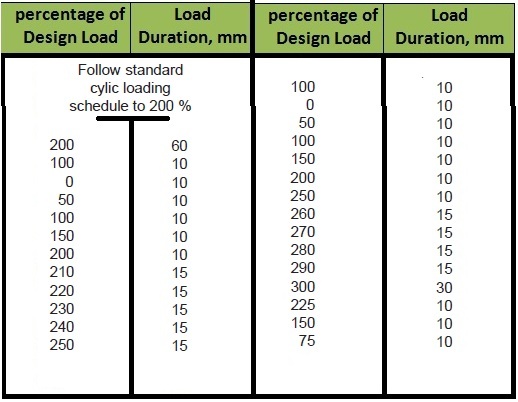 Loading selected for lateral load testing should be applied at elevation of pile cut-off level. Testing equipment should be calibration before each test or tests in a testing program.Hydraulic cylinder should be calibrated under load testing equipment having hydraulic cylinders for complete range of traveling piston to increase or decrease applied loads. Double action hydraulic cylinder should be calibrated for both push & pull modes. Calibration reports should contain temperature at which calibration was conducted. The equipment which need to be calibrated should defined before commencing calibration. Except pulling load, lateral load should be applied by one or sometimes more hydraulic cylinder, having spherical bearings. If more than one hydraulic cylinders are required to exert test loading, all should have identical piston diameter, should be connected to common manifold & pressure gauge and one hydraulic pump should be used for operation. Total jacking system including valves, hydraulic pump, hydraulic cylinder and pressure gage should be treated as a unit while calibration; the recommended accuracy should not be less than 5 percent of applied load. Load cells and similar devices should be calibrated to accuracy ≥ 2% of applied load and should have spherical bearings. If pulling force is applied to exert lateral loading, the equipment should be capable to apply constant steady forces within expected range of loading. In-line load indicative devices like dynamometer should be calibrated with an accuracy of not less than 10 percent of applied load. Test plate or plates are set vertical side of test pile at application point or points of load and normal to line or lines of loading. 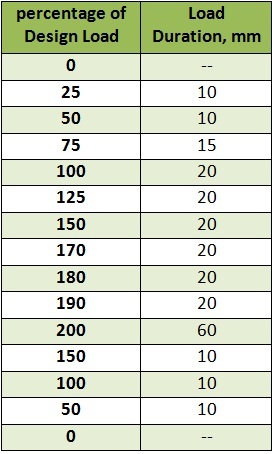 Test plate should be of steel having sufficient stiffness to have resistant against bending under applied load,but at least 50 mm (2”) thickness is essential. Test plate should have adequate size to accommodate hydraulic cylinder; the dimension of horizontal side of plate should be at least on half of pile diameter or receiving side dimension of test pile or piles but not more than pile diameter or dimension of receiving side of pile or piles. When tests conducted on single piles except square piles, the pile head can be capped to facilitate placement of test plate against a vertical plane bearing surface or it can be set by high-strength grout or can be welded adequately to side of pile using appropriate filler material to establish complete bearing against projected area of test pile. If test plate is/are supported independently of test pile while assembling testing apparatus, temporary supports should be removed while applying test loads. The main objective is not to be overstressed to transmit applied loads. Sufficient thickness of bearing plates should be ensured to resist bending under lateral load but must be at least 50 mm thick. Struts should be of steel having stiffness and size to transmit applied loads without buckling or bending. Blocking is used between hydraulic cylinder or reaction piles and reaction system, as shown in Fig. 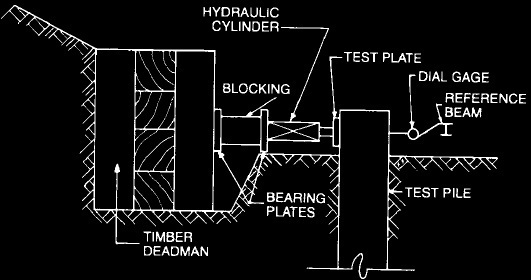 blocking should have sufficient strength and size to resist crushing or any type of distortion under test loading. In applying test load in lateral direction, one reaction system is required to support hydraulic cylinder or cylinders. This should provide greater resistance than expected maximum test load and can be placed in any suitable distance from test pile. Hydraulic cylinder (s) with or without load cells should be set in horizontal position along the line of lateral loading and fixed against test plate. Between base of cylinder and reaction system, steel strut or other suitable blocking should be placed steel bearing plates as discussed above are set with both end of strut or blocking. Steel struts should be placed horizontally along line of applying load and suitable bracing should be ensured so that they don’t shift while loading. When two hydraulic cylinders are required, both cells (with load cells, if used) and struts/blocking should be placed at same level and placed at equal distant from line of load application i.e. placed at opposite side of each other.This line is considered passing through center of test group. Necessary support should be provided to jack, struts, bearing plates and cribbing/blocking for stability. The hydraulic cylinder, load cells, struts or blocking are transferring system for lateral loading, but supports are required to hold them. Reaction piles offer us such supports; usually two or more piles are installed vertically but batter piles sometimes in combination with vertical or only batters are used. They offer required reaction capacity to support maximum expected lateral loads chosen to testing. Reaction piles are capped by steel, timber or reinforced concrete.Bracing between piles or any type of fastening system of pile butts are done to make them a unit to develop lateral resistance of entire group. Batter piles should be inclined away from test pile or their group, unless two opposite batter piles are installed. For a proper site or soil conditions, deadman is installed which consist of timber panels, cribbing, sheeting or identical construction supported against side of excavation or embankment so that required reaction capacity for maximum expected lateral loads can be provided. A platform constructed of suitable materials like concrete, timber or steel and loaded with adequate weights to provide necessary support for the load transferring system. This should have sufficient bearing surface on its edge to support them and necessary resistance for lateral load test loading. Other reaction systems like any suitable existing structure can be used. Optional loadings will produce different results and will be applied only when engineers approve or provided requirements for this loading. During testing in both preproduction verification and proof test phases, care should be exercised to avoid permanent structural damage of pile that will reduce axial capacity. So criterion for acceptance (defined by maximum movement under certain load) must be selected carefully not to produce potential damage to structures. After standard loading are applied and removed, following loads are applied and removed in addition to standard test loading. In this type of loading multiple loading of specified number at any certain load level are applied to micropiles. Surge loading can be applied during or after standard loading. These loading is applied at a constant rate by continuous operation of hydraulic jack or other alternate energy source and removed at a constant rate by gradually release of power source. Above schedule shows 2 surges at 3 load levels. If number of surges or different loading levels are specified, follow the identical loading & holding pattern. After completion of loading and removal of standard loading, surge loading is reapplied at each defined load level with specified nos. of loading cycles and maintained for sufficient time at every zero & peak level of loading and recording data for load-movement log. In this type of loading, lateral loads are applied on pile either by pushing and subsequent pulling or vice versa. 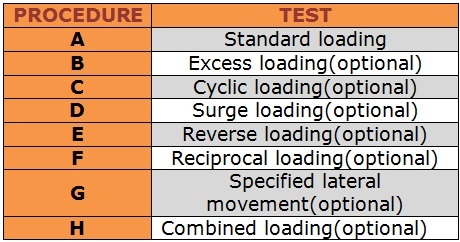 Pile or their group as specified in standard loading, excess loading, cyclic loading or surge loading are at first applied in one direction which is followed by loading in opposite direction. This loading involves application and removal of every specified lateral loading at first in one direction which is followed by application and removal of loads in opposite direction for number of cycles specified in design. To facilitate monitoring of reading of load and deflections, every peak & zero loading are held for specified period. Regarding reversing and reciprocating loading, it should keep in mind that suitable set up of apparatus is required. Various sizes of double acting hydraulic cylinders are available in the market which can be operated manually or by electric power or by air-hydraulic powered pumps. A suitable system of crank with connecting rod combined with appropriate measuring device is used in case of reciprocal loading. 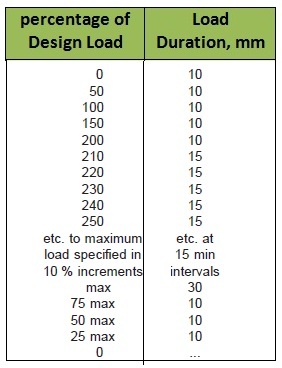 Lateral loads as specified above are applied until total lateral movement of test pile or their group is as defined and subsequent removal of test load in 4 equal reduction levels permitting 10 minutes between reductions. In this case, test pile or their group is subjected to test under lateral loading in combination with axial loading, may be compression/tensile loading. 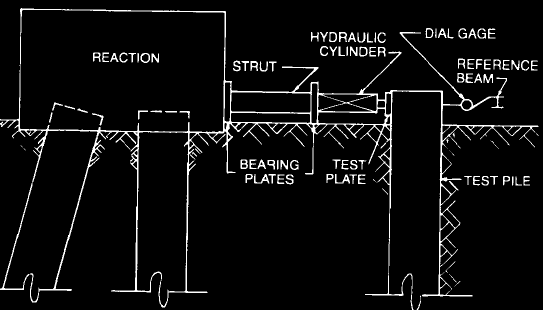 Lateral load can be applied through hydraulic jacks supported against reaction system as discussed above or load can be applied using hydraulic jack or jacks placed between two test piles or their groups. One problem should keep in mind that axial load may exert significant restraint to pile or their group against lateral movement. Specified axial load (compression) according to ASTM D 1143 is applied but suitable antifriction device is essential. Generally plate and roller assembly or antifriction plate assembly as specified in ASTM D 3966 are used.Testing under lateral loading with tensile axial loading is more complex as construction of a system without restraint against lateral movement under lateral loading is very difficult. These combined loading is suggested as it simulate practical conditions. Precautions are taken not to exert any vertical load that is the component of lateral loading or lateral component from axial loading. • Keep entire test area with adjacent work spaces, platforms, walkways etc. free from debris, scrap, small tools, accumulated mud, snow, ice oil, grease or other loose and slippery substances. • Provide cribbing, blocks of quality materials, timbers with proper service condition having flat surfaces (round edges should be avoided). • Hydraulic jacks should have bearing plates of hemispherical shape or firm and complete contact with bearing surfaces should be ensured and should be aligned to eliminate eccentric loading. • Loads should not be agitated, hoisted or suspended on anyone and tag lines will be used around potential hazardous areas. • The test equipment should be designed and accepted by qualified engineer ensuring sufficient factor of safety to safely transmit required test loads. • All jacks, test beam(s), bearing plates or members of frame should be fixed firmly or sufficiently blocked to avoid slippage while applying or removal of test load. • Components of reaction system should be balanced and stable; during testing, the reaction system should be monitored to determine imminent unstable conditions. All reaction frames, test members and apparatus should be supported adequately at all times. • Dataloggers, load-cell readout, monitoring equipment and pumps should be located as far as possible from loaded members (may be in tension or compression), jacks and their connections and support to establish safety in the test area.